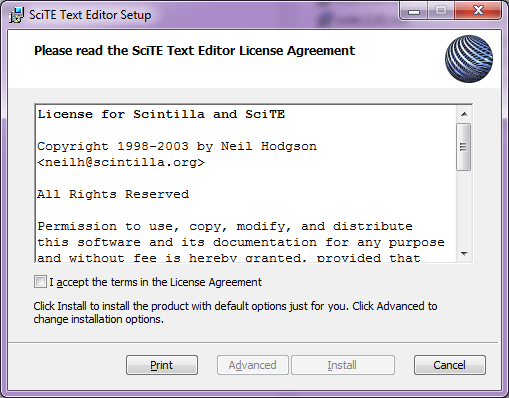 The SciTE Text Editor, whilst being one of the most lightweight editors available, is also one of the best. I created my own package simply to provide a one-stop setup for SciTE with all the extras I, and probably most other people need. The binaries are straight from the Scintilla website, and I have packed in my own mod of the context menu fix from André Burgaud and Angelo Mandato. The installer is built with WiX via the excellent SharpDevelop and of course the sourcecode is available. The programs menu is created upon install by default. ​I have tested this on Windows XP, Vista and Windows 7, 8 & 8.1 32bit & 64bit, and Windows 10. The packages are split in order to support respective platform runtimes. The shell extension installation is optional as part of the install process. Note this package is not associated with the official SciTE project, I am providing it as a convenient distribution. Also modified html.properties to add a custom Tidy Source option for html and xml files using html Tidy. ​As mentioned above, since releasing the installer for SciTE 2.22 I have modified the context menu from André Burgaud and Angelo Mandato for this package. The original context menu was simply 'Edit with SciTE', and while it was effective and easy it wasn't so great for us dual-screen users. SciTE itself has a global option of 'check.if.already.open' which enables one to always open a new file into a new tab. The bad thing about this option is that when this is switched on, you can never open SciTE in a new window. So to open two files and sit them side-by-side or in individual screens when using multiple screens is impossible with that default option set. Couple that option with the context menu and you can only ever have open in tabs or (with the option switched off), open in new window. The respective options do exactly what they say and you now have full control. I didn't really like the idea of an extra context menu because I always liked the simplicity of the existing solution. This, however, was the only way I could think of to get the flexibility for opening files. I'm open to suggestions as to how this can be improved, so fire me an email. SciTE, based on scintilla, is simply the best text and sourcecode editor out there. It is essentially an advanced replacement for notepad - something for coders, scripters, and even the average, non-technical user. It loads up pretty-much as fast as notepad which is a pretty good benchmark. Install it and throw away notepad and every other text editor you might have had the misfortune to install. It also handles huge files without crashing. Something other editors struggle with, especially if you need to work with large log files or similar. That was a showstopper for me when testing other editors - while they worked great, they simply failed on large files. I don't want one editor that's good with small files along with another that specialises in large files. I just want an editor. Simple. You can even customise properties files to handle languages not included with the package. It also works incredibly efficiently on huge files. No more crashes or lockups because the file is too big. Change Log info for SciTE can be found here.